1-3 Jan: This is when upwards of 2.7 million people from the Kansai region flock to the shrine. Golden Week, 27 April - 6 May. The Emperor abdicates on April 30, and his son ascends the throne on 1 May. The shrine will be very crowded during this 10-day Golden Week. August - It’s extremely hot and humid in Kyoto in summer. Climb only if you’re prepared. Otherwise start at sunrise. It is considered discourteous to be disturbing the gods in the hours of darkness while they rest. Give the gods a break! You’ll make it difficult for the ambulance service if you slip and fall in the night. There are also wild boars that come out at night. The shrine is very empty between sunrise and 8am even on the busiest of times. Start your walk at sunrise and you’ll find it quite empty on any day. Follow our Google Maps guide. 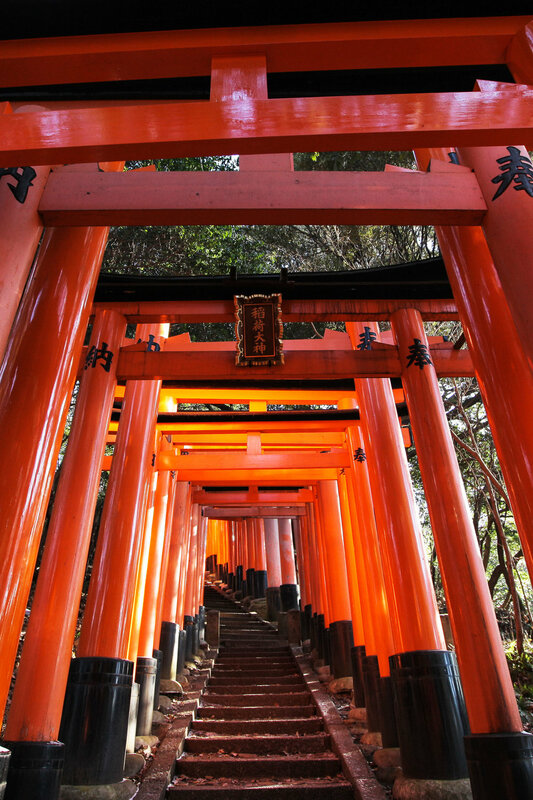 Or join Craft Tabby’s Alternative Fushimi Inari Walking Tour. We take you off the path, so come on the guided tour if you don’t want to start at sunrise. Explore hidden waterfalls and go off the path with us. ▵ Crowded but bearable. Do not bring kids. ▲ Unbearably congested, avoid if all possible. ▲ 1 Jan, 6pm - Saitansai 歳旦祭. Honden at the base shrine. Prayers for the new year. The shrine will see over 2 million visitors on the first 3 days of the year, so steer clear unless you want to be part of the crowds. ▵ 5 Jan, 12pm - Ooyamasai 大山祭. Honden at the base shrine. The gods at each of the seven landing spots on the mountain were offered mochi rice offerings in the past, so the priests commemorate the practice at Gozendani at 13:30. ▲ 12 Jan, 2pm - Houshasai 奉射祭. Hill behind the base shrine, before the Thousand Torii Gates. The priests shoot arrows in 4 directions to prevent impurities from affecting the year’s harvest to come. ▵ 14 Jan, 1pm - Seinensai 成年際. Honden at the base shrine. Men and women coming of age on that day (turning 20) greet the gods. Descendants of samurai families and merchant folk dress in Heian-period dress in the main hall for the ritual. The Seinensai is preceded by other festivals at the inner shrine at 11am, and occurs in conjunction with an offering ritual at Gozendani at 1pm. Overall a very busy day. ▲ 2 Feb, 8am - Hatsuumataisai 初午大祭. Honden at the base shrine. The whole shrine will be abuzz on this day because the first shrine on the mountain was built in 711, 1308 years ago, on the First Day of the Horse. People from all over the city flock towards Inariyama for branches of cedar, shirushi no sugi. ▲ 3 Feb, 9am - Setsubunsai 節分祭. Gaihaiden (stage in front of the main shrine) at the base shrine. Priests, shrine maidens and volunteers throw packets of red beans into the crowd at the end of the ritual, around 9:30am, at 11:30am, and 1pm. Collect the beans for good luck throughout the year. ▵ 11 Feb, 10am - Kigensai 紀元祭. Gaihaiden (stage in front of the main shrine) at the base shrine. Martial arts performance to mark the ascension of the first Emperor of Japan. ▵ 17 Feb, 10am - Toshigoi-no-matsuri 祈年祭. Honden at the base shrine. Festival to ensure a good crop of grains for the coming year. ▵ 10 Mar, 1pm - Otsukataisai 御塚大祭. Honden at the base shrine; volunteers hold their own rituals at the mini-shrines throughout the shrine complex. ▵ 1 Apr, 11am - Kenkasai 献花祭. Gaihaiden (stage in front of the main shrine) at the base shrine. The Ikenobo, the oldest and largest school of Ikebana in Japan, performs an arrangement ceremony in front of the main shrine. ▵ 7 Apr, 10am - Kenchasai 献茶祭. Honden at the base shrine. A master from one of the major tea schools offers tea to the gods. ▲ 7 Apr, 1pm - Sangyosai 産業祭. Dance stage to the right of the main shrine. Shrine maidens perform the sakura dances to thank the gods for clothing, food, and shelter. The dances are magnificent. Photography is not allowed. ▵ 12 Apr, 11am - Minakuchihashusai 水口播種祭. Paddy field. Priests seed rice in the paddy field. It’s just seeds at this point so there isn’t much to see. There is likely to be cherry blossoms blooming above the field, however. ▲ 21 Apr, 11am - Inarisai / Shinkousai 稲荷祭・神幸祭. Base shrine and Tabisho. The gods make their annual trip around the city on large wooden palanquins. They first tour the neighbourhood nearby, then arrive at the Tabisho (rest stop) behind Aeon Mall at 2pm. They remain there till 3 May. ▵ 3 May, 4pm - Inarisai / Kankousai 稲荷祭・還幸祭. Base shrine. The gods return. A ritual is held to greet the gods upon their return. Curtains are put up when the carriages with the palanquins arrive, and branches of the holy cedar are given away freely. ▵ 10 Jun, 1pm - Tauesai 田植祭. Paddy field. Shrine maidens plant rice while singing the rice planting song. ▵ 30 Jun, 3pm - Ooharaeshiki 大祓式. Between the main gate and the stage in front of the main shrine. A large chinowa (ring made of rice straw) is placed at the entrance for visitors to cleanse themselves for the remainder of the year ahead. The chinowa is placed there from morning, so pass through it before then. ▲20 Jul, 6pm - Yoimiyamatsuri 宵宮祭. Drummers and dancers put on a performance for the gods in front of the main gate. Then the lights to thousands of lanterns on the mountain come on at dusk. This is the only time the entire mountain is brightly lit up. 400 Japanese paintings will be exhibited around the main shrine. All these are for the Motomiyasai, to be held the next morning. ▵ 21 Jul, 9am - Motomiyasai 本宮祭. Honden at the base shrine. Inari believers from all across the country visit the shrine to give thanks. The lanterns are lit again in the evening. ▵ 2 minor festivals on 8 Aug at 11am, and 15 Aug at 11am. This is the hottest month on Inari. ▵ 3 minor festivals on 1 Sep at 9am, 15 Sep at 10am, and 23 September at 11am. This is the wettest month on Inari. Avoid at all costs if there is a typhoon approaching Kyoto. Massive trees, torii gates, and power lines have been known to collapse in the strong wind. Heed the main shrine’s instructions if they shut trail. ▲ 12 & 13 Oct, 1pm - Kouintaisai 講員大祭. Honden at the base shrine. Inari believers from the country over offer food and prayers for the blessings of previous 10 months and a good harvest ahead. ▵ Last 2 weekends of Oct - The shrine is usually very crowded in this period, with foreign tourists arriving in large numbers. ▵ 24 Oct, 10am - Kenchasai 献茶祭. Shrine office. Not open to the public. The urasenke school of tea offers tea to the gods. ▵ 25 Oct, 11am - Nukihosai 抜穂祭. Paddy field. The rice, fully grown, is harvested in preparation of the rice offering festival on November 23. ▵ First 2 weekends of Nov - The shrine is usually very crowded in this period, with foreign tourists arriving in large numbers. ▲ 1 Nov, 11am - Kenkasai 献花祭. Gaihaiden (stage in front of the main shrine) at the base shrine. The Saga-Goryu school of Ikebana, with 1,200 years of history behind them, offers an arrangement ceremony to the gods. The event itself is not likely to draw a massive crowd, but this event corresponds with the peak of the foliage tourist season. ▲ Minor festivals on 5 November at 3pm, 6 November at 1pm, 2pm, and 3pm. ▲ 8 Nov, 1pm - Hitakisai 火焚祭. The priests lit a massive bonfire that goes on for an hour on the hill behind the main shrine. The entire shrine is crowded at this time. Into the bonfire goes thousands of wooden votives collected since the last Hitakisai in 2018. The ash is believed to be healing properties, so devotees wait till about 3pm to collect some. ▲ 8 Nov, 6pm - Mikagura 御神楽. The priests perform a very slow song and dance with traditional instruments till 8pm for the gods’ enjoyment. Visitors can watch from the main stage. Arrive by 5:30pm for a good view, but beware - the music is extremely slow. ▵ 23 Nov, 10am - Niinamesai 新嘗祭. The end of the rice harvest. Newly-milled rice is presented to the gods in the honden of the base shrine. ▵ 31 Dec, 3pm - Ooharaeshiki 大祓式. Between the shrine office and the honden of the base shrine. 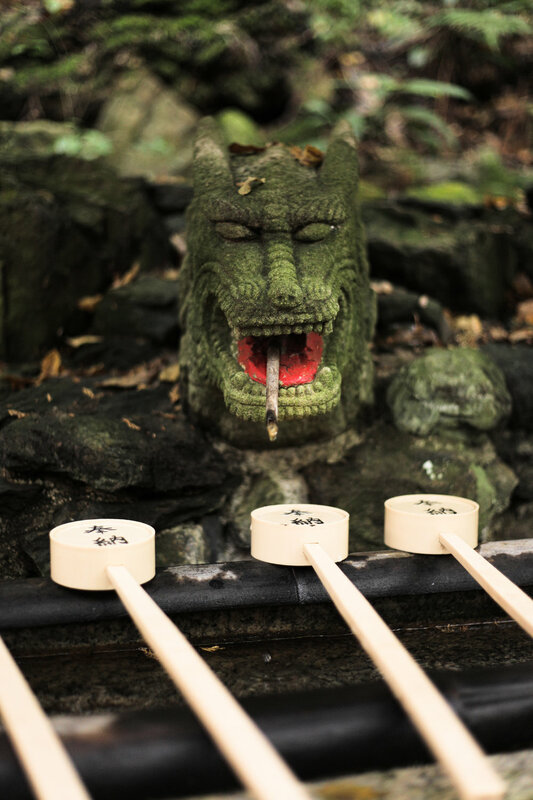 The priests perform a ceremony to cleanse attendees of their impurities accumulated over the second half the year, since the last Ooharaeshiki on 30 June, and to thank their gods for 2019.